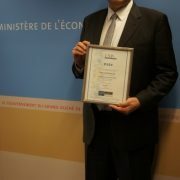 At a press conference held at the Ministry of the Economy on Wednesday 1st of February, Étienne SCHNEIDER, Deputy Prime Minister & Minister of the Economy, Jean-Marie REIFF, Director of ILNAS (Luxembourg Institute for Standardisation, Accreditation, Security and Quality for Products and Services) and Bernard MOREAU, CEO of Labgroup, marked the start of Archiving 2.0. 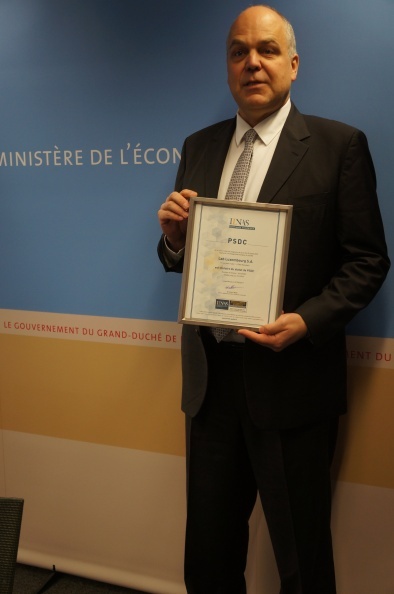 Indeed, the certification of the first PSDC (Provider of Digitisation and Conservation Services), concretises the implementation of the law of the 25th of July 2015 on electronic archiving, and the establishment of the digital trust chain, which extends from the European Union to the holder of information, through the Luxembourg State and the third-party archiver. As a third-party archiver for 40 years in Luxembourg, Labgroup had to prepare itself for the future by initiating its digital transformation in the early years of the 21st century. The strategy aimed to be the leading edge in the evolution towards a paperless society (or, in the medium term, with less paper). 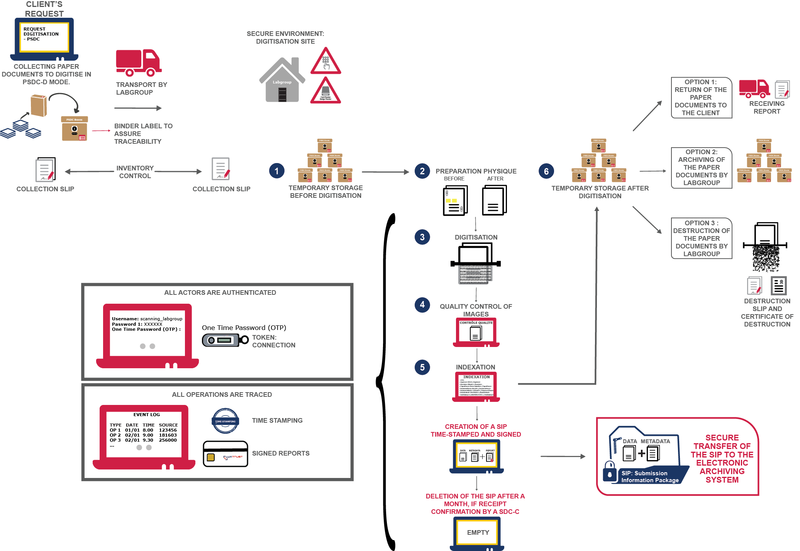 In parallel with investing in a state-of-the-art, highly protected storage and archiving infrastructure, Labgroup has developed a comprehensive and continuously improved Information Security Management System (ISMS). These efforts to control risks were rewarded in 2014 by obtaining the ISO 27001 international certification (already a first for an archiver in Luxembourg), in terms of information security management covering all related activities (digitisation, physical and electronic archiving). With this first step achieved, it remained to obtain the new status of PSDC, created by the law of 25th July 2015 on electronic archiving. As the first candidate, Labgroup was logically the first company whose processes and procedures conformed to the requirements of the PSDC standard, Labgroup was audited in November 2016. Following the positive verdict of the certifying body, ILNAS placed Labgroup on the list of legal persons with the status of PSDC under the number 2016/9/001 and implemented immediate supervision for which the institute is responsible. Provider of Conservation Services, which guarantees the integrity, confidentiality and persistence of electronic archives throughout their retention period. This achievement, on the 40th year anniversary of the company’s creation, marks the beginning of a new era of growth for Labgroup! Legal archiving, a trusted service. Whether as a consumer or a company, we archive information to be able to (well) defend our own interests in the future, for example, our health in the case of medical data. Since three millennia, the archiving of the writings is inseparable from its paper support. However, technological advances now make it possible to perform native electronic records, such as purchasing on an e-commerce site, and to dematerialise paper documents, such as signed contracts in a handwritten manner. The legislator has considered these advances by creating a legal framework that anticipates and supports the irresistible digitisation of our society. The law of 25th of July 2015 on electronic archiving therefore recognises the probative value of electronic copies of paper documents produced by a PSDC certified company to respect all the conditions of strict fidelity to the original and, moreover, the presumption of conformity with the original. requesting Labgroup to digitise their paper archives, then destroy them and only keep the electronic copies. In either case, Labgroup will proceed as required by the law and as schematised here below. In order to strengthen citizens’ digital trust, the law stipulates that PSDC’s must provide its clients with a well-documented prior information package before the signing of any service contract. This documentation must be kept available by Labgroup. granting the legal value to a digital document. While Luxembourg has been a precursor with this new law, other countries have also embarked on the path of digital transformation by introducing an attractive legal regime for electronic archiving. 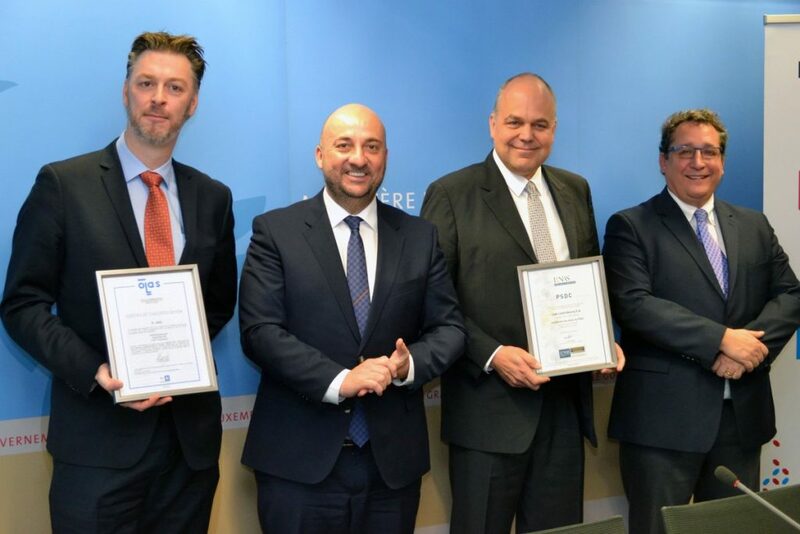 However, no other country engages the state through the certification of service providers, such as the PSDC status in Luxembourg. By archiving in Luxembourg, companies in those countries could therefore both exploit their national legislation and benefit from the guarantees offered by the PSDC status. Indeed, the rules and requirements to which Labgroup must comply as a PSDC are equivalent to those established by the Belgian law of July 21, 2016, called Digital Act, and the French decree of December 5, 2016 on the reliability of the copies and taken for the application of Article 1379 of the Civil Code. The French and Belgian judges will therefore find, in the certified conformity of the PSDC in Luxembourg, objective reasons to rule favourably on the reliability of the digital copy.